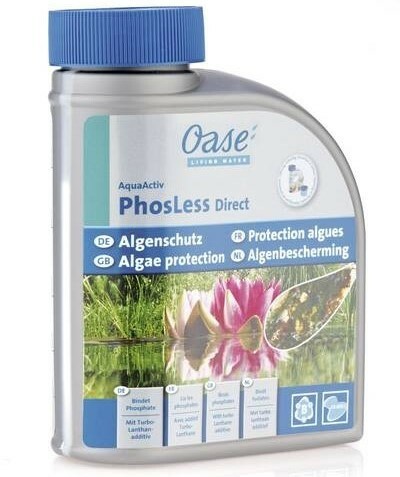 PhosLess Direct is an effective way of reducing the level of Phosphates in pond water. Phosphates are nutrients present in water that promote the growth of all algae types. Phosphates levels in the pond can increase rapidly after heavy rainfall, or as a result of wasted nutrients in fish feed or fish waste. PhosLess Direct acts quickly to remove Phosphates and thus limits algae growth in the pond. Effective removal of Phosphates in ponds water, restricting algae production. Reduces Phosphates down to an acceptable level 0.035 mg/l or below. 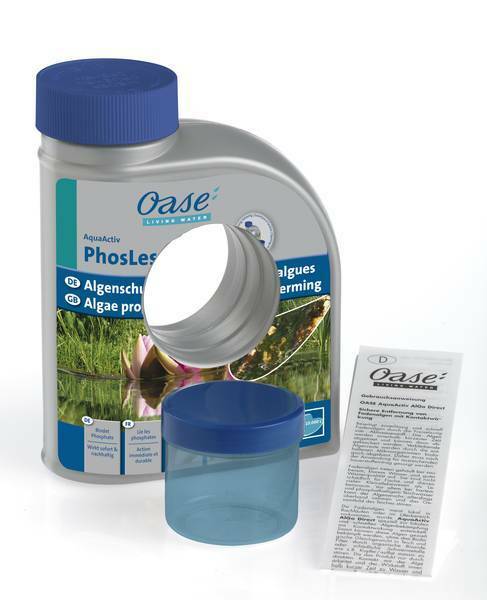 Binds 80g of Phosphate per 100ml of treatment. Binds hydrogen sulphides, preventing foul odours. Ideal for use after algae treatments to prevent re-growth. Ideal for application in early Spring to prevent algae bloom with rising temperatures. Safe for use in fish ponds containing Koi and Sturgeon and does not affect the pH level. 500ml will treat ponds up to 10,000 litres water volume.